Hi there yes you read that right is so blimmen freezing I need that winter coat back on!! hee hee but that's not what I mean with my title. I am talking about the lovely technique Joseph's coat. 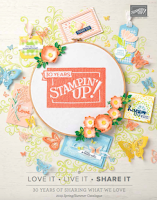 I shot a video for our Stamp With Us members and I fell in love with it all over again. It is such a beautiful technique and like many others so little used. 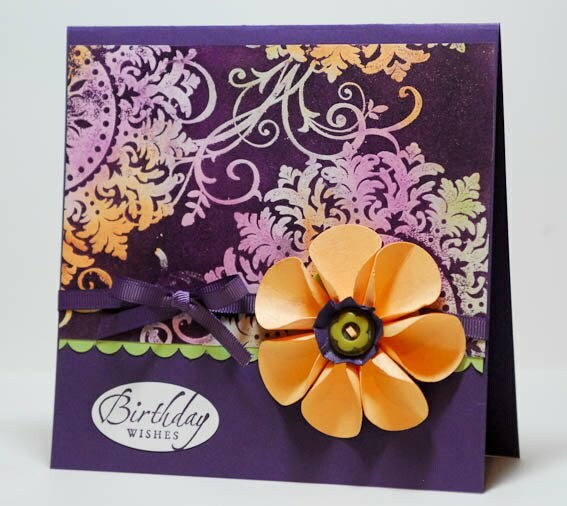 I have used Apricot Appeal, Certainly Celery and Pale Plum for my background colours swirled across some Whisper White card stock, I then embossed in clear the Medallion and Baroque Motifs stamps. 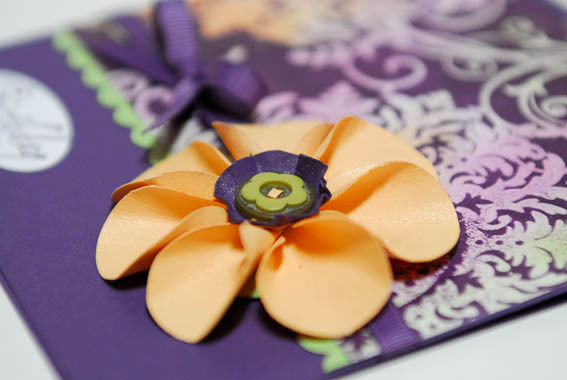 The final step was to sponge Elegant Eggplant ink all over the card including the embossed areas. The result dramatic and so very beautiful. I have since played with a fee variations of the same technique you will have to wait and see them soon. ...well the flower was simply made from 1 1/4"circles. Simply twirl the edges against something like a bone folder and bend into a cone shape. Stick in place onto a circle piece and add a centre. Love how this card ended up. Finally I managed to ink my Bird on the branch. I adore this set and I love RICH RAZLEBERRY!! But I have to confess I love Melon Mambo more *shock* as I really thought razzle will be my fave. So Rich Razzleberry, Melon Mambo and Summer Sun, the branch was stamped in Soft Suede and the dots in the softer So Saffron. 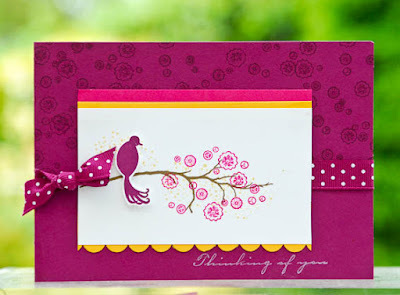 Stunning cards Monica, I love the resist technique you used and that flower is fab!! Absolutely gorgeous card Monica - love the technique - and the medallion and baroque together. Fab flower too! Love the colours they are so beautiful!!! Just got the medalions stamp, maybe I will give it a go soon!! I am loving everything here (always love everything you do) ... you are so, so inspirational. Thanks for sharing with us. The Joseph coat card Monica Is one of the most spectacular cards I have seen. A real WOW the colours work amazingly well!! Thanks for sharing your gorgeous work I love popping in for some inspiration.